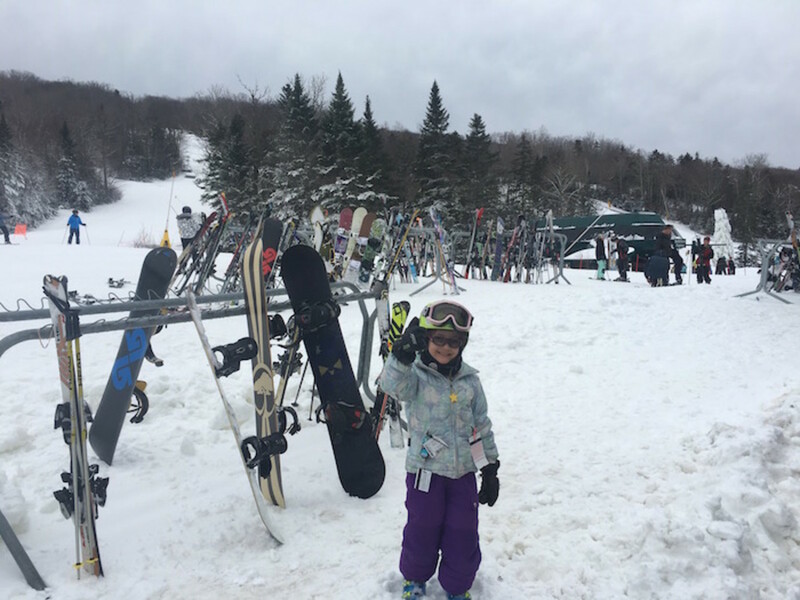 New Hampshire has some relatively undiscovered gems when it comes to family skiing. 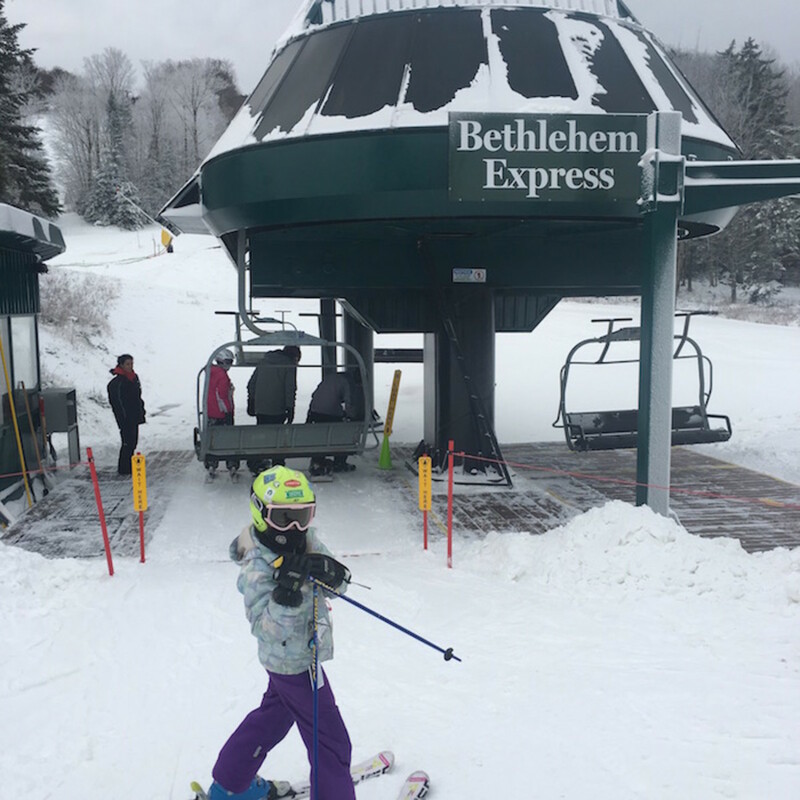 During our Christmas week visit to New Hampshire we were able to check out Cannon Mountain and Bretton Woods to get the story on New England ski options for our Annual Family Ski Guide. To start the story, I must explain the conditions. The East has been unseasonably warm this year. It&apos;s been tough going for many of the resorts, but with the magic of snow-making machines and a little pluck, they&apos;ve put together a good early season. On the plus side, the temperatures are mild, making it really enjoyable to be outside all day. On the down side, we didn&apos;t get to ski everything. 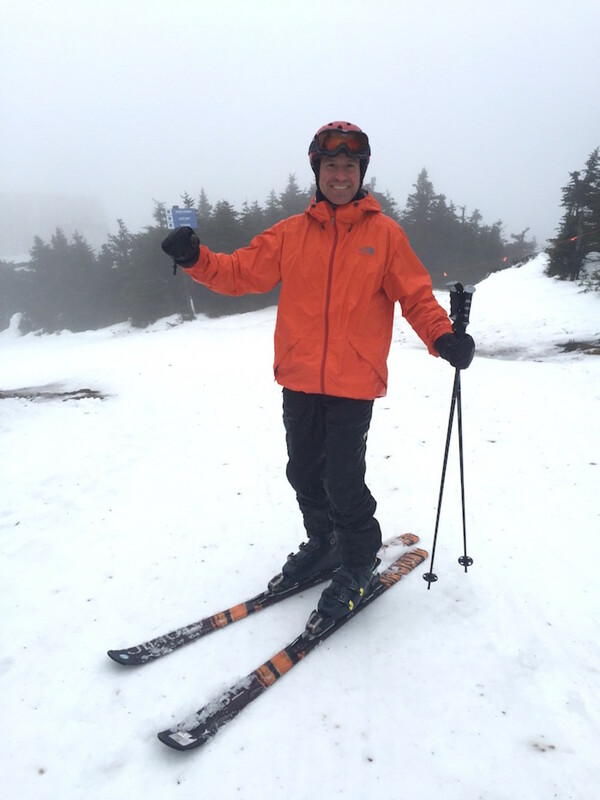 But our first taste of New Hampshire skiing left us wanting more. Let&apos;s start with Cannon a ski hill in the White Mountains. Known for it&apos;s steep terrain and fast skiers, Cannon is trying to spread the word that they are family friendly. Cannon couldn&apos;t be in a prettier setting. The hill is located inside Franconia Notch State Park. Cannon Mountain Ski Area has 10 lifts servicing 265 acres of skiing. They have an established racing program (in fact 5x Olympic medal winner Bode Miller started on this mountain) and often the less extreme portions of Cannon are overlooked. The management at Cannon is spending a great deal of effort to attract newbies and young families to the mountain. They&apos;ve expanded the learning facilities and I spoke to the head of the ski school, John Bruckner, about the programs. John said that they look for coaches and instructors that love learning and know how to have fun. Cannon has both seasonal and daily programs for families. Seasonal appeals to locals and those who want to make a weekly commitment to the sport. The daily programs are great for families that are just skiing for a day or two. 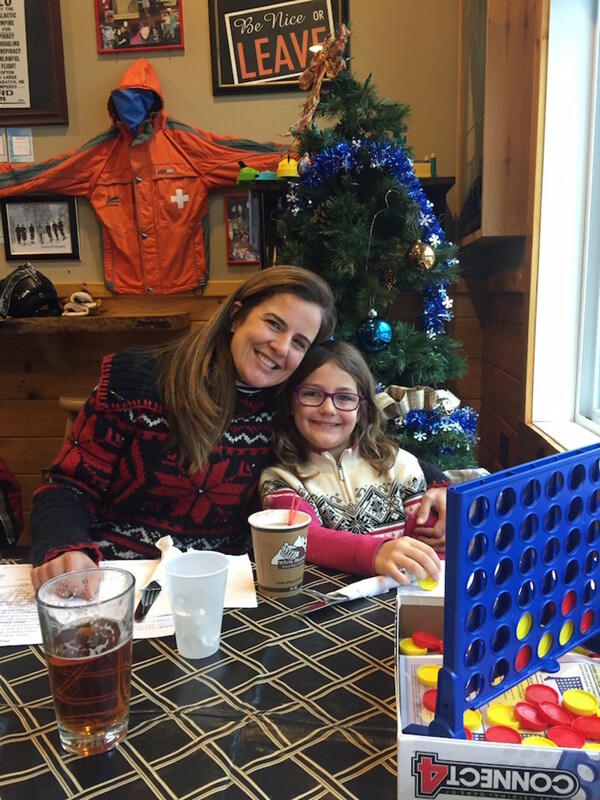 Cannon likes to end most lessons around lunchtime so the families can get back together to eat and then ski together in the afternoon. For more details on the lessons head here. Don&apos;t miss the Tuckerbrook beginners area with the kids. It&apos;s a space designed to shelter new skiers from speed demons. Adults and kids can explore this area without fear of high-speed collisions. It&apos;s a really thoughtfully planned out mountain. Mr. Momtrends put in two days on Cannon. He liked the variety of terrain and was really impressed with the snow-making. Cannon has spent a slew of money on high-tech equipment to spread the white stuff. They also expanded the expanse of the mountain clearing a parcel of land and adding the Mittersill lift. For those of us who want to find new challenges on the slopes, this is sure to deliver. Lift tickets are $77 for adults (there are deals and specials) and ages 6-12 are $55. Kids 5 and under are FREE! 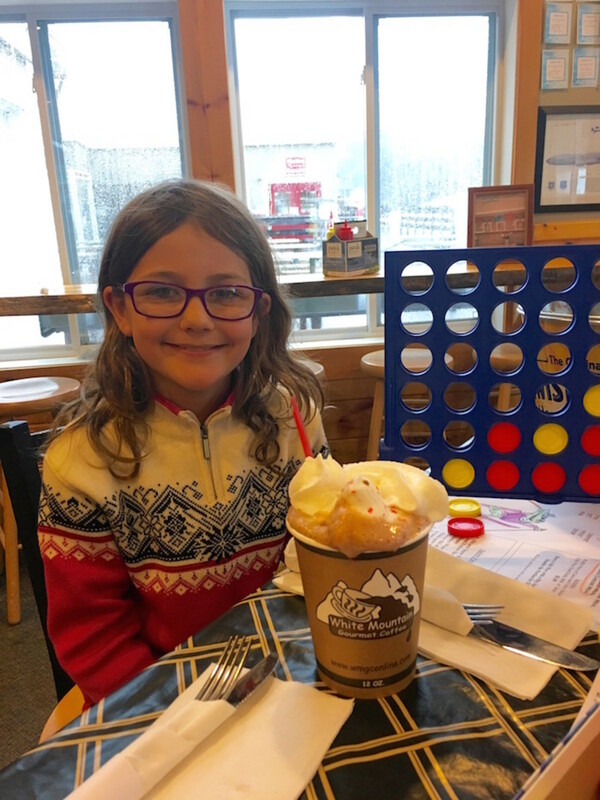 Since my daughter and I opted out of the rain day of skiing, we were able to check out the Cannonball Pub located in the Peabody Base Lodge. Check out this photo: That&apos;s a hot chocolate with whipped cream AND a peep! Happy camper! Since I didn&apos;t need a sugar-high, I sipped one of the local beers from New Hampshire called Frosty Goggles. The pub also had a great assortment of games. We played Connect Four and while I lost repeatedly, Mr. Momtrends got in his runs. 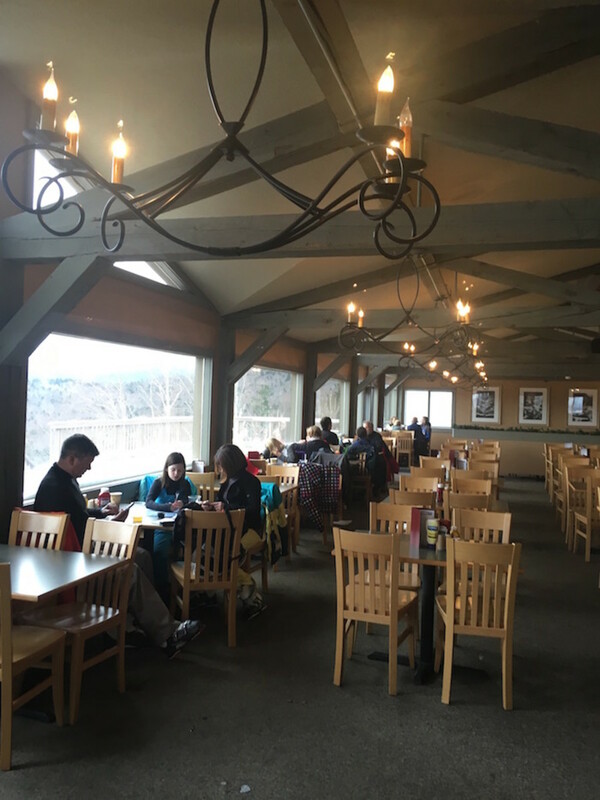 They also have on-mountain dining at Cafe 4080&apos; located in the Tram Summit Lodge. We returned the next day to nicer weather, and I&apos;m sure we&apos;ll be back there next season too. Get more details about Cannon here cannonmt.com. Our other ski experience was at Bretton Woods. When we skied there, they had the benefit of fresh snow. Bretton Woods is part of the Omni Mount Washington Resort. This is a genius way to get families on the slopes. It&apos;s just so darn cute and convenient. We were able to catch a shuttle from the posh resort and be at Bretton Woods in 5 minutes. For young families, you can&apos; beat this access. Need to be home for someone&apos;s nap time? You&apos;re just a short shuttle ride away. Bretton Woods has a well-appointed lodge right at the base. There&apos;s plenty of space to stash your gear for the day in tidy little cubbies and ample room to get the kiddos into ski gear and boots. I hate cramped lodges and this open, clean bright room was a welcome surprise. 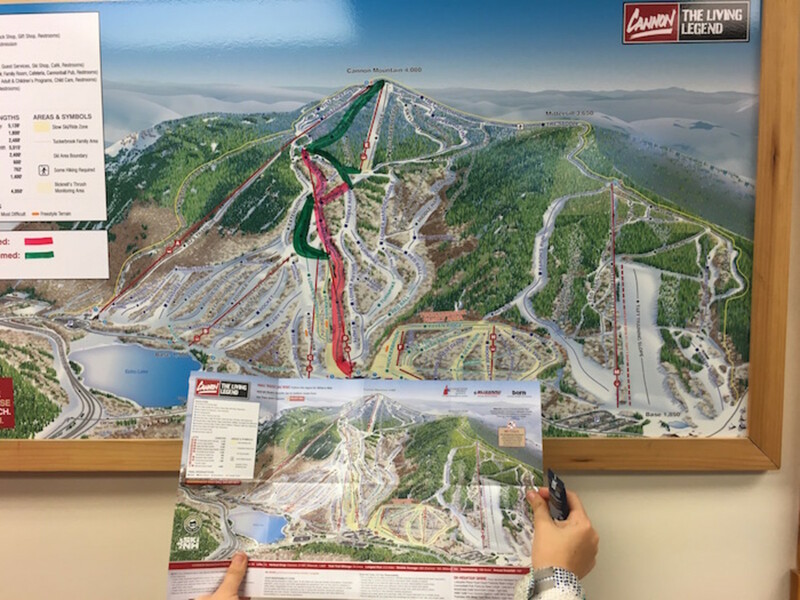 Once you&apos;re outfitted (the rental shop is located downstairs) you&apos;re just a few steps away from the lifts. To the left, you&apos;ll find the dedicated beginner&apos;s area. In the center, hop on the Bethlehem Lift to start your day with some easy blues and greens--we like Sawyer&apos;s Swoop to start the day. From the top of you can see the resort. Isn&apos;t it pretty? And the snow is pretty reliable too. Bretton Woods touts the fact that they are #1 in the East for grooming. This picture is at the top of the RoseBrook Lift. If you like popping in and out of the trees you&apos;ll love skiing the glades here. Bretton Woods makes the most of the scenery. This is an ideal place to escape from the crowds of the East and make some ski memories with the kiddos. While we didn&apos;t get lessons, I did a little research. I know they take ski school seriously. They also have very active seasonal options and race program. For daily lessons head to the Hobbit Ski & Snowboard school. This is for skiers 4-12 and snowboarders who are 6-12. Lessons run from 8am to 3pm. And the $140 fee is pretty standard out East. There’s also babysitting near the base for ages 2 mos. to 5 years (check out the SnowPlay option which get the littlest ones on skis). This means mom has no excuses not to suit up and ski! 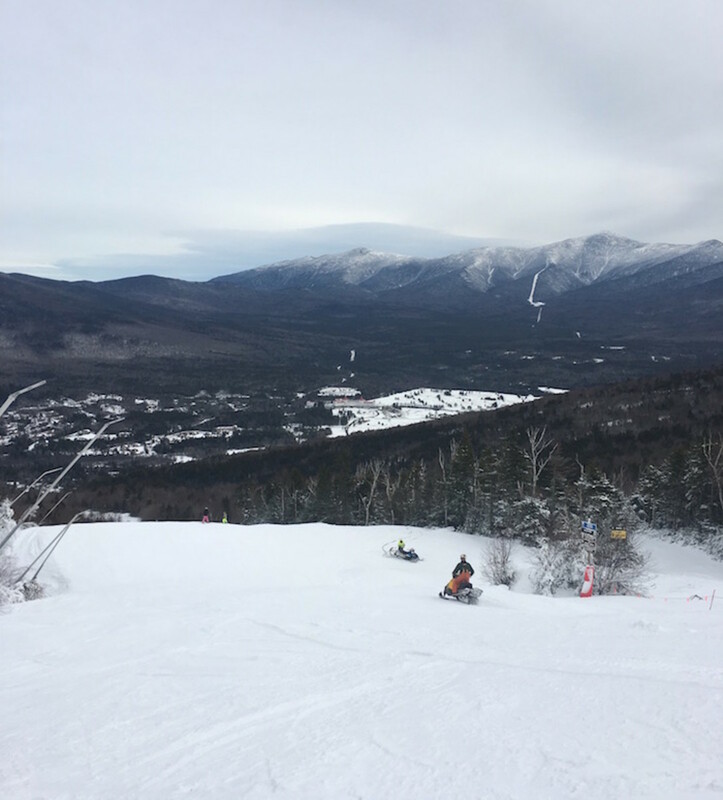 Bretton Woods has three terrain parks to challenge the kids. If you forgot some gear, they have a well-appointed ski shop called Tree Tops. For lunch head to Latitude 44° Restaurant. While it&apos;s not the most appealing from the outside, inside there’s a western charm and lovely views. 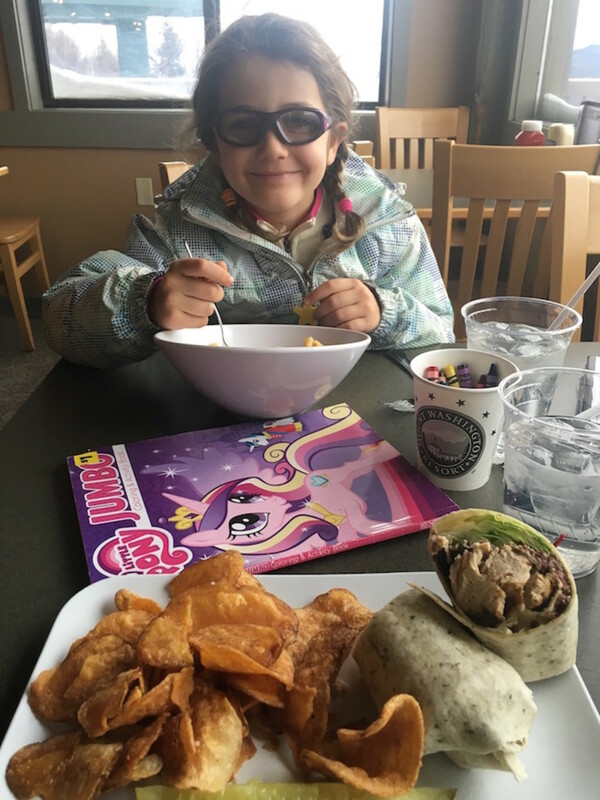 I was impressed with my quinoa/chicken wrap, and my daughter loved her gooey mac and cheese the coloring book they provided. The summit sits at 3100’ with a 1500’ vertical. There are 464 acres of skiable terrain and 62 trails with this breakdown 25% easy 29% intermediate 30% advanced and 16% expert. Good news if the snow gods aren’t smiling, 92% of Bretton Woods can be covered in man-made snow. Here&apos;s how the mountain stacks up--they get 200+ inches of snow a year. So while they may be off to a slow start, it&apos;s coming. We think it&apos;s one of the most family-friendly, full-service resorts on the East. Lift tickets are $66 for the day for adults and $38 for kids 5-12. Great to see rates that ladder up--there&apos;s even a teen rate! Oh, and if you&apos;re over 80 or under 4 it&apos;s FREE! Book your vacation here brettonwoods.com. This is not a sponsored post. We were given lift tickets to assist in the review.